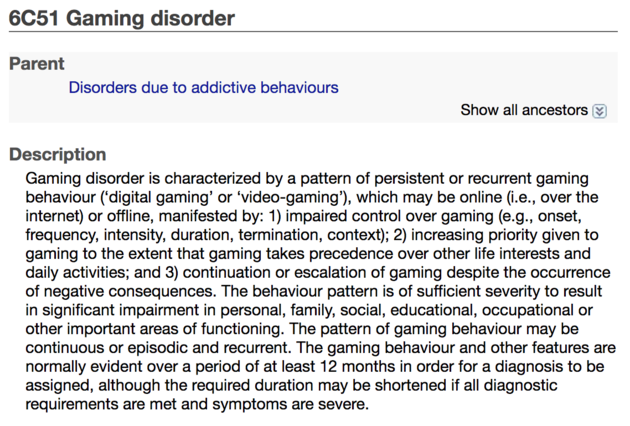 The World Health Organization (WHO) recognizes video game addiction as an official addiction as of today. It is the first major body that has ruled this. However, what dictates whether you are addicted to video games or just enjoy playing them? The WHO distinguishes three things that are characteristic of a game addiction: a lack of control over how much you play games, a preference for gaming compared to other activities in your daily life and playing games, even if that comes with negative consequences. A 2009 study shows that nearly 9 percent of young players are addicted to games. Experts think that the number has increased because the gaming has become more mobile and social. The WHO also warns that excessive gaming may give rise to other health problems, such as insufficient physical activity, unhealthy eating habits, vision or hearing problems, muscle complaints, sleep deprivation, aggressive behaviour and depression. The recognition of game addiction as a disease coincides with a general climate of resistance to the dominance of technology in daily life, where excessive use of smartphones and social media is increasingly seen as problematic. The Entertainment Software Association (ESA), the sector association of the game industry, is against the decision of the WHO. The organization calls the classification “completely wrong” and points to the “educational, therapeutic and recreational value of games”. Approximately 2.6 billion people worldwide play video games. Annual sales are expected to increase by 31 percent in the next three years to $180 billion. Like it or not, video games are here to stay and it’s only recently that any major bodies have started conducting research on the effects of gaming and the results vary significantly based on who is conducting the research. Do you agree with the decision of the WHO in regards to “gaming addiction” or feel that gaming can be a problem with more than a small number of people? Let us know in the comments!